Enjoy my blog as I take you on my journey. You will read about my trials of recovery, parenthood, photography, cooking and my life on a farm! Now let's have some fun! I tend to plant my garden a little later than most. I plant in late May for two reasons. One, it seems we always have at least one late frost and I'm not that person who covers up her garden for protection. Two, I do not want the garden to be ready for harvest during our county fair when we are busy for seven days. That being said, my garden has been plentiful for a few weeks now and of course it seems that all of the veggies gang up on me and are ready to pick at the same time. I enjoy canning until I get so overwhelmed I beg the plants to just wilt up already, but it's not in me to just let them go. Hearing the pop of the lid sealing, viewing all of my hard work on the shelves and eating organic food that I grew in the dead of winter makes it all worth it. Pickles, tomato juice, sauce, pasta sauce, ro-tel, salsa, green beans and jalapenos are the bulk of my summer canning. 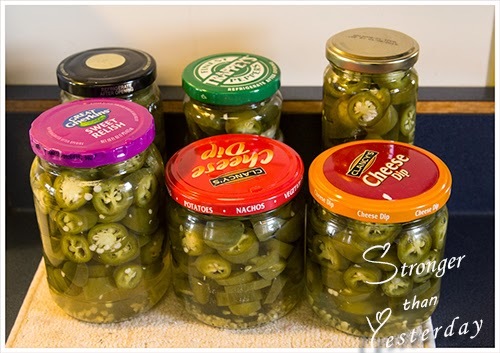 Jalapenos are one of the easiest to can. 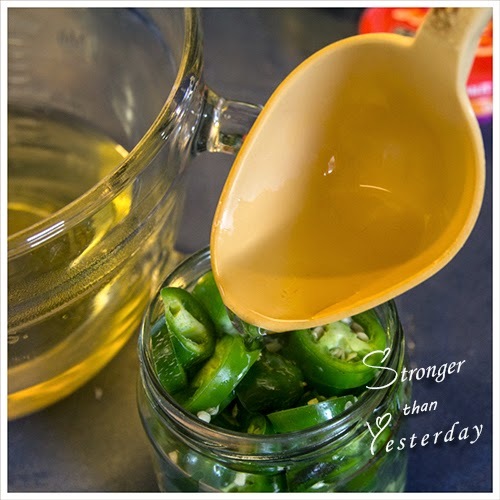 My husband and I enjoy spicing up our foods and although I have frozen some of the peppers, I tend to stick to canning them. It seems they stay crisper that way. 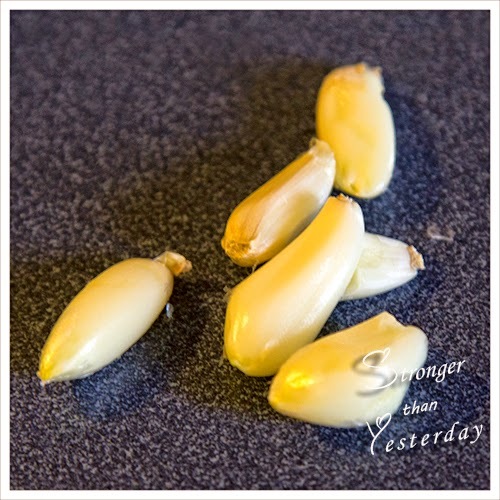 Canning them can be as easy as slicing them up and putting them in a jar and filling it with hot water, maybe a half a teaspoon of salt, if you wish. I save my jars from the grocery store and use them 3-4 times before discarding them. 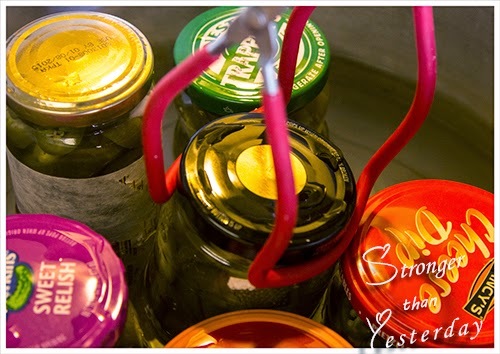 If canned correctly those lids will seal just like the Ball jar lids and you've already paid for them once so use them as long as you can. Note: when canning a large batch it is imperative that you wear rubber gloves. I didn't even give it a thought until my fingers felt like they had flames shooting out the ends of them because the oils from the jalapenos has soaked into the pores of my skin. You know, our skin is the largest organ we have and the most absorbent. So here is me, dancing around the kitchen trying anything and everything to get the burning to stop, chastising myself for such silliness. I will only have to make that mistake once in my lifetime. I like to put my jars and lids in the dishwasher before canning. This sanitizes them but it also heats them so I don't have to add another pot to my stove. 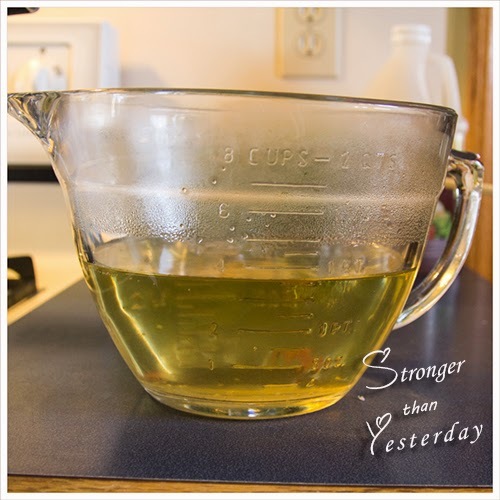 Also if I am canning small portions, I heat my water in the microwave instead of stove top as well. 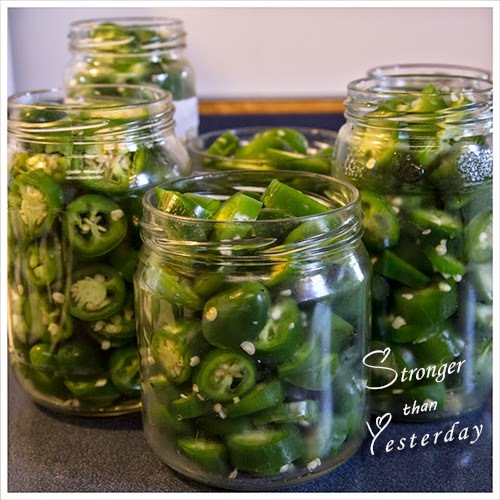 So, heat your jars and lids, make sure the water in your canner is heating while you are preparing your jalapenos by slicing them. I slice them into rings. I also leave in the seeds and ribs, you can remove them if you do not want as much heat. Another note: the longer you leave them sealed in the jar the more heat the peppers will produce. Now I've been told how good they are sliding down the gullet and I've also been told how they set you on fire while passing through the poop shoot. I suggest putting the date on the jar and if it's been over six months, that person is choosing that risk on their own. No fault of yours! Add the peppers to your jars and do not overfill. I had to remove a few from the tops of my jars. I like to add a clove of garlic to each jar as well. 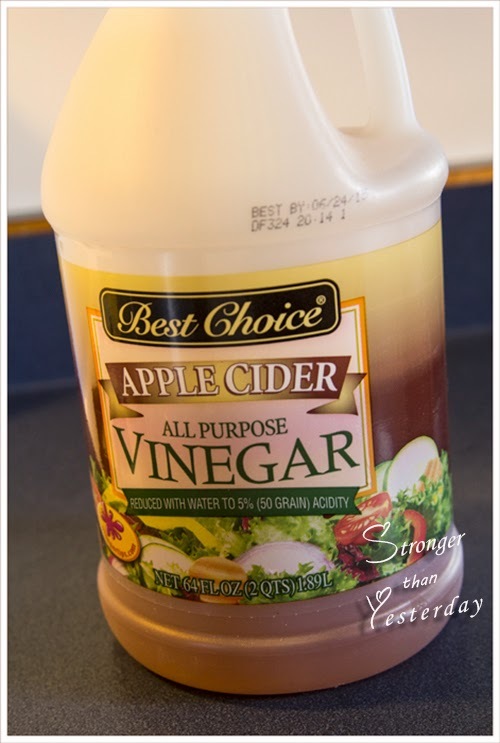 Add 1 cup apple cider vinegar to 3 cups water and boil in microwave or on stove. Next ladle it in your jars until the peppers are covered. I would use a funnel, unlike I did in this photo and it will end up in the jar instead of all over your counter. 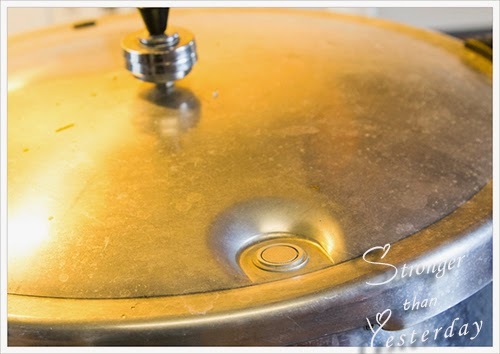 Set those jars in your hot canning water, pop on the canner lid and set your timer for 20 minutes. After 20 minutes turn your burner off and when your pop up valve drops you may remove the lid (away from you) so the steam does not melt your face off and peek inside. 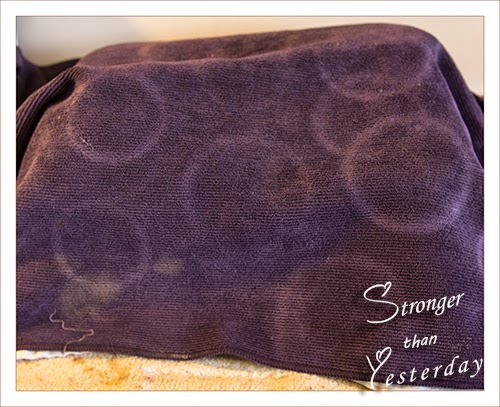 Definitely using your jar grabber would be a smart choice and place them on a thick towel or pot holder. I then, cover the jars with a couple of heavy towels and allow them to cool gradually. After and hour or so you will start to hear the lids "popping", which means they have sealed. We will use these for salads, soups, chili, sandwiches or whatever I want to add a little heat to. But I do enjoy the adding flavor to my peppers instead of just canning them with plain water. It really isn't difficult and if you enjoy pesticide free veggies, growing your own is the way to go. Many years ago, I started calling my kids, my little Fahrvergnügen's. (Fahr. Verg! Gnü. Gen) I don't know why I did this really, I know I just enjoyed the pronunciation of the word. 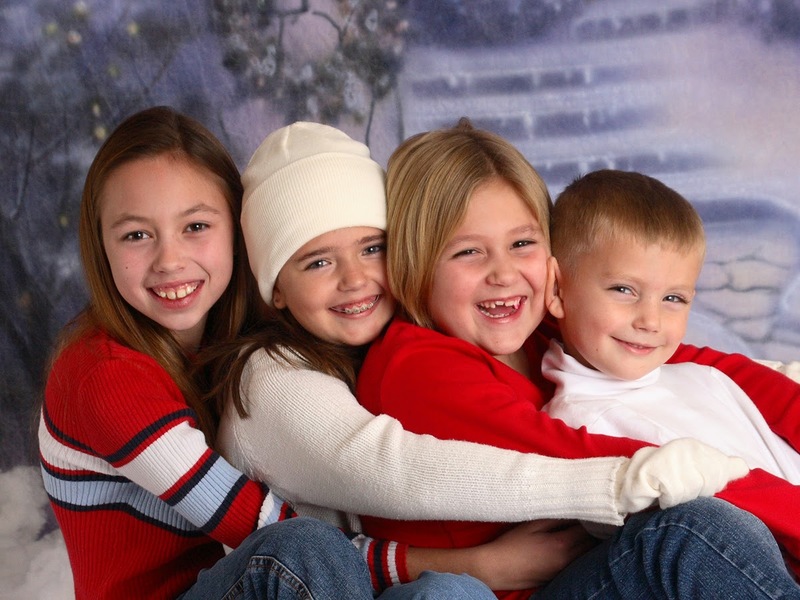 So it started with Liv, progressed to Drew and again when I added Hayley and Mackenzie to my family. They are all my little fahrvergnügen's. Some fifteen years later, I cannot remember where I retrieved this term from. With some hard thinking, I surmised I took it from a television commercial. 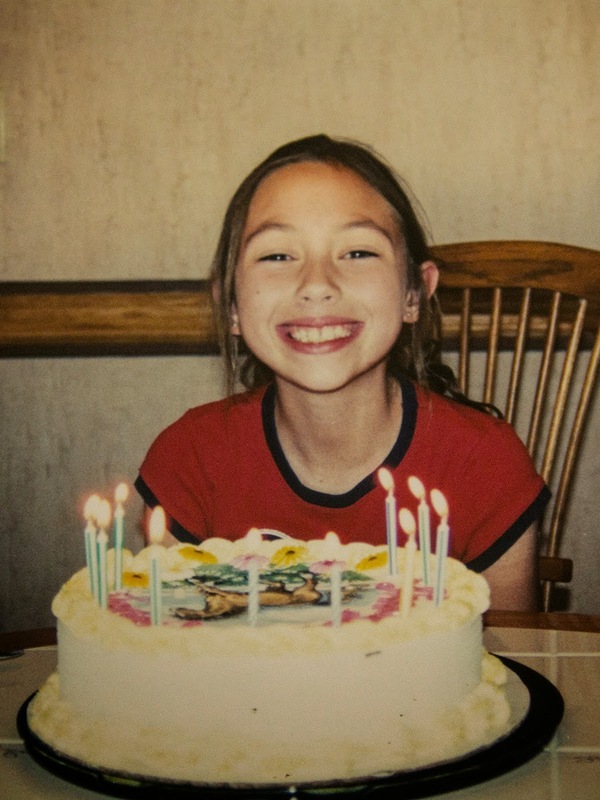 Nearing the age of thirty-nine with four teen kids and going through premature menopause, I was not quite sure I should trust that recollection or not. This week, I decided to indulge into some internet researching, not only to prove I can still remember things, but to really find out what the meaning of this word is. I mean, what if for fifteen years I have been calling my kids something morally wrong? As it turns out my memory is still intact. 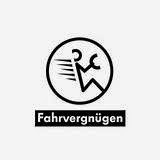 Fahrvergnügen is a German word. That's kind of obvious, not only by the spelling, but also the pronunciation. It is a term used as an advertising slogan used by the German automobile manufacturer Volkswagen in a 1990 U.S. ad campaign, that included a stick figure driving a Volkswagen car. 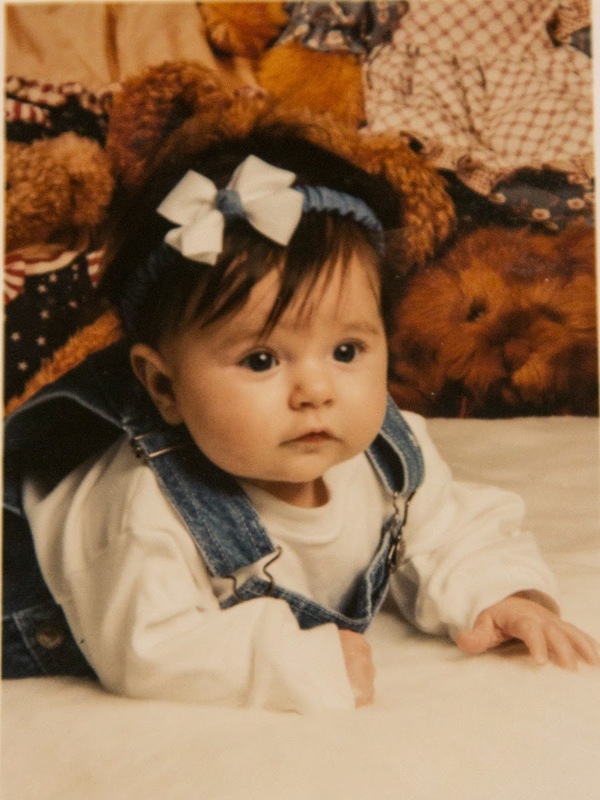 Now, my first child was not born until 1998, so that commercial was either extremely popular to run that long, or Volkswagen had run out of ideas for almost a decade. One of the tag lines incorporating the word was: "Fahrvergnügen: It's what makes a car a Volkswagen." It has been incorporated into my daily word use, not always used in the same fashion though. I use it loosely, actually. When the kids were small I would use it endearingly, " Oh my precious fahrvergnügen", meaning my little angel. As they turned older "you little Fahrvergnügen" as in, you silly. So I say, I am pleased that all of this time I was calling my kids a type of enjoyment. Maybe for future use, I should understand the meaning of word I intend to use out of context. Just in case. 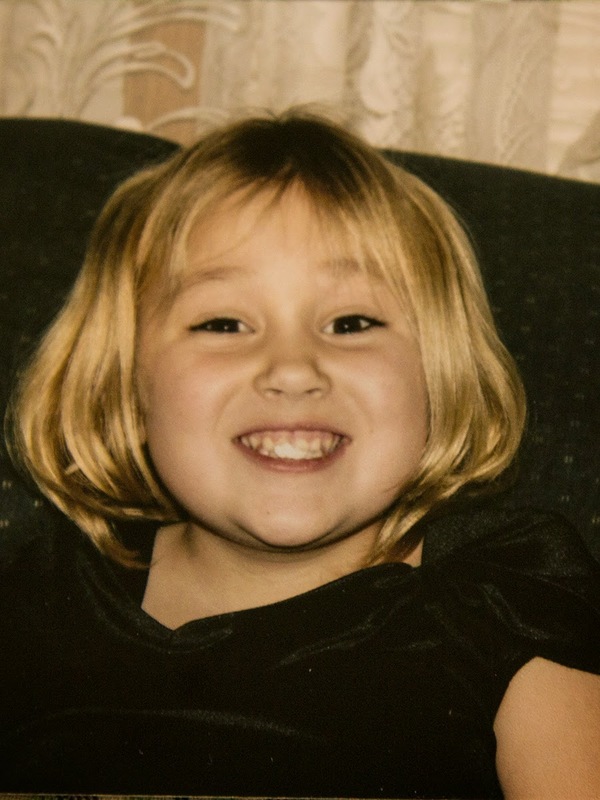 Carey Portell. Ethereal theme. Powered by Blogger.